of routes that we know of on Taipan Wall. Does anyone know of any extras? 25) Seventh Pillar Direct Finish 14m mid-high 20s? 39A) Groovy Extension - Cossey Bros? 47) Project 4 - ringbolts up disconnected scoops R of Mr J.
Combo route at grade 16. Start up World Party, right along ramp and up to 1st belay on Anaconda. (29) I put the bolts in this one...quite hard...Ive done it in about 4 sections. I'll look forward to seeing the completed topo. I woudl like to record the locations of every route and project. Confusing lines of bolts need to be marked 'confusing line of bolts leading no-where'. yes, I believe that's what Garth graded the first pitch (unrepeated?). Second pitch 28 by Stuart. a much more consistent route that way. How is the the topo going? Any chances of a look see. This topo is part of the 'grand plan' stapylton guide. Online in the near future. I would say that Father Oblivion (26)** is as good a quality as Sirocco and some of the other routes you have given three stars... but I am obviously biased. Kaa (24)* should definitely get 2 stars. It's great fun and being the easiest free route up Taipan makes it accessible for a lot of other climbers. probably only get 2 each. May so but its one of the least good routes on the wall. 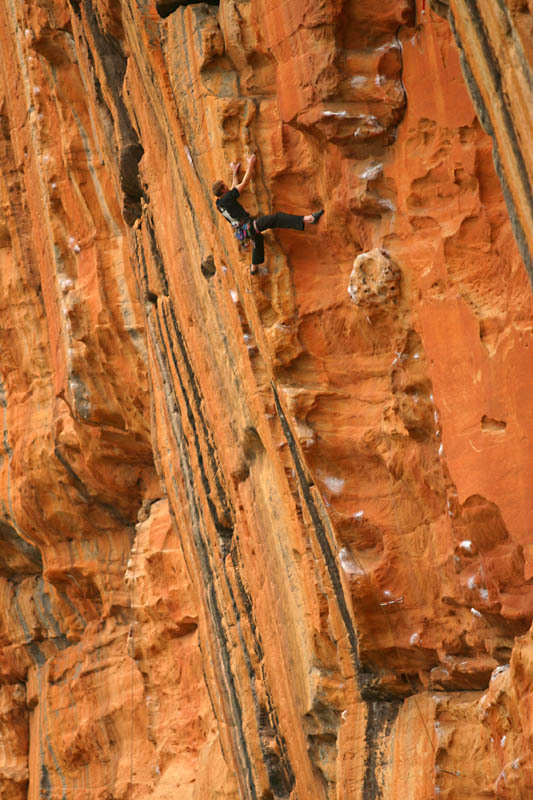 >easiest free route up Taipan makes it accessible for a lot of other climbers. the two upper pitches though as my partner injured his neck whilst contorting through the first pitch. Gee, I would have thought Mr Joshua would get three stars for the climbing alone. I reckon it's pretty hard to fault. It doesn't have the stopper moves that are a feature of some of the other Taipan routes. It's direct, climbs the entire cliff and both pitches are quality. I've spoken to a couple of visiting climbers (Peter Croft, Ken Palmer) who have each onsighted the entire route and they both reckoned its one of the best routes they had done anywhere. Don't worry Simey - it will certainly be getting *** in the guide. >May so but its one of the least good routes on the wall. Just to weigh in with 2cent's - awesome idea to produce a definitive topo to the wall Neil - it would make an unreal wall poster a la the Yosemite Super topo. Pretty much agree with all the commments above, including Father O worth 3 stars (can't believe I'm saying that on a public forum). Only addition I'd make is that there is no way Feather Boa is 28 - it took me four full days complete with a last move bungle and having to come back for another redpoint. Its at least a full grade harder and quite commiting, but the grade is difficult to define as the cruxes are by no means straight forward. Regardless it's the best route I've done on the wall and one I'll remember forever. The last pitch is really cute too. By way of comparison, around that time I did a bunch of other routes supposedly as hard or harder on the wall 2/3rd try - so to give FB 28 you'd have to give venom 25/26, and groovy, Cardigan St & anaconda - 26 too. Whilst on the topic of Anaconda it's worth mentioning that doing all three pitches in a single pitch on a 70m is highly recommended. In fact it's possible to do World party as a single pitch as well - great fun. Mr J also deserves 3 stars at least - has to be the best 25 in Australia. This thread should be renamed "Jonesing for Tiapan"
>definitive topo to the wall Neil - it would make an unreal wall poster a la the Yosemite Super topo. >Father O worth 3 stars (can't believe I'm saying that on a public forum). street stand out from the others. >The last pitch is really cute too. and it could all be yours.